Autism Speaks continues its outstanding efforts to raise autism awareness and funds for autism research with its latest effort the Autism Speaks 400. This is another terrific way to tell the world about autism. DOVER, DE (May 18, 2007) — Dover International Speedway announced today that the June 3, 2007 NASCAR NEXTEL Cup Series race will be named the “Autism Speaks 400 presented by Visa.” Autism Speaks is an organization dedicated to increasing understanding and knowledge of autism spectrum disorders; to funding research into the causes, prevention, treatments and cure for autism; and to advocating for the needs of affected families. 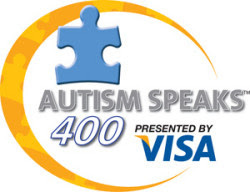 From now until June 1, Dover International Speedway will donate $5 to Autism Speaks from each ticket purchased with a Visa card for the June 3 “Autism Speaks 400 presented by Visa” race. 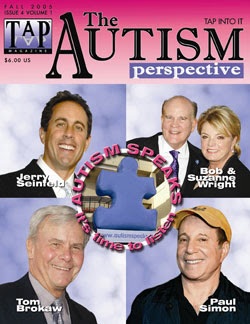 Fans can visit http://www.autismspeaks.org to learn more and donate to this worthwhile cause. The parents were apprehensive, as these treatments were expensive – as high as $100 per hour. There is in the world autism community, at least on the internet component of that community, a group which portrays itself as the true voice of autism. It is essentially an internet based community comprised of some high functioning autistic persons, some parents of autistic children, and some “professionals” including some psychiatrists and educators who oppose attempts to treat or cure autism. Self described as the Neurodiversity movement this group poses as human rights advocates for the autistic but often resembles a hate group in its personal attacks and demonization of any parent or group which attempts to find and fund treatments and cures for autism. Any mention of the serious challenges of the more severe forms of autism is attacked by the high fucntioning autism internet essayists. Even mentioning that some autistic suffer from cognitive deficits, even the use of the expression “low functioning autism” is met by hostility from the Neurodiversity advocates. Far from being the true voice of autism, Neurodiversity is a false voice; an autism vox falsus. “I really don’t have anything to say about Don Imus — I am no fan, to be sure — but living here in New Jersey, and my husband being a Rutgers alum — I have been appalled, or just outraged, at his use of “crude, offensive language” about the Rutgers women’s baskbetball (sic) team last Wednesday while discussing their defeat in the NCAA Women’s Basketball Championship. Much of the autism discussion found on the internet does not seem directed at the very real concerns of families raising autistic children. Little of it provides practical assistance for the very real challenges facing families with an autistic child to raise and care for. The same is also true for the mainstream media. Despite all the attention generated by Autism Awareness Month in the US and the good efforts by the people at Autism Speaks, Oprah Winfrey and the View, there is very little coverage of, discussion of, or even acknowledgment of the realities of life that await autistic children, particularly those with severe intellectual, communication and behavioral deficits when they grow older, when they become youths and adults. In New Brunswick Canada our residential care and treatment capacity is extremely limited. Information is not readily available to autism organizations about what facilities and services do exist. Requests for feedback sent to residential care home operators by the New Brunswick Autism Society went unanswered by the owners of those facilities. Government officials generally engage in the time honored tactics of delay and divide the autism community and lumber on with the same inadequate resources currently available. In New Brunswick youths and adults who reside in residential care facilities will be cared for by staff with little or no training in autism or behavior management techniques. When frustrations and conflict arise from strained relations between untrained staff and persons with autism spectrum disorders there is no one to take the side, or offer the perspective of, the autistic youth or adult. Assault charges then follow against the autistic youth or adult who is supposedly being cared for in the residence. In New Brunswick a year and a half ago an autistic youth was sent to reside on the grounds of the Miramichi Correctional facility. He had been convicted of no crime or offence. He was sent there because the Province of New Brunswick lacked the residential care or facilities in which he could live and receive treatment. Ultimately he was sent out of the province, out of the country, to a facility in the State of Maine. New Brunswick has a central mental health facility in which persons with a variety of mental illnesses reside. The facility does have a psychologist on staff but the facts of life for an autistic person living in that facility are not pretty. I have visited that facility in the past with a father who told of arriving on short notice and finding his adult autistic son, barely clothed, in an isolation room with a hard wet floor. When we arrived we found exactly the same situation. There is little in the way of recreational programs or activities organized for severely autistic adults. It might be different in other provinces and states in North America. Living in New Brunswick Canada this is the future that awaits severely autistic children as they age. As the father of an autistic son, now 11 years old, I can not ignore that future. It is the ultimate autism reality check. Autism Speaks has done a terrific job in raising Autism Awareness and in emphasizing the need to take action to cure autism, to provide effective autism interventions and to raise funds for research into autism causes and cures. At Conor’s house we do not wring our hands and agonize over the right metaphors to use while talking about autism issues. Our priorities are found in improving Conor’s ability to participate in and enjoy life to the fullest extentpossible. We find joy in Conor not in his autism and we seek not to “accept autism” but to provide Conor with evidence based treatment and education to overcome to the fullest extenet possible the deficits that autism brings. To date only ABA meets the evidence based standard but other evidence based interventions may emerge with research. And Autism Speaks is a driving force today in raising awareness and funds for that research. At Conor’s house Autism Speaks and we are listening. Autism Speaks has filled a leadership vacuum with its effective leadership on behalf of autism. Autism awareness and funding for autism research will be raised by Autism Speaks walks across North America. The public communications power of entertainment and political stars such as Senator Hillary Rodham Clinton, Toni Braxton, Bill Cosby, Jerry Seinfeld, Paul Simon and many others, has been harnessed to raise awareness and funds for research. Legislative initiatives such as Senator Clinton’s recent Expanding the Promise initiative in the US Senate have been undertaken. The Autism Every Day video featured at the Sundance Film Festival has helped the world move past the Rain Man/Savant stereotypes and understand some of the harsher realities faced by many autistic persons and their families. As the parent of a profoundly autistic 11 year old boy in New Brunswick Canada I have been involved in autism advocacy for 8 years. Lack of knowledge by important government decision makers and by members of the public has been a huge obstacle to overcome in trying to improve the life prospects of autistic persons in our neck of the woods. The incredible media power of Autism Speaks, the focus on doing something positive for persons with autism, has helped, and will continue to help all of us fighting for improved treatment, education and residential care for persons with autism – wherever we live. The Autism Cause picked up more heavyweight support with the introduction by US Senators Hillary Rodham Clinton and Wayne Allard of a legislative proposal which would expand services for autistic persons of all ages. The struggle to raise awareness about autism, and obtain effective evidence based treatment and education services for autistic children, has dominated public advocacy and attention in the US and Canada. This effort by Senators Clinton and Allard draws much needed attention to the needs of autistic persons of all ages including adults. 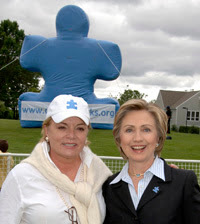 Autism Speaks has also announced that Senator Hillary Rodham Clinton will serve as the honorary chair for the fifth annual Westchester-Fairfield Walk for Autism Research on Sunday, June 4. March 20, 2007 — Washington, DC – At a press conference on Capitol Hill, Senators Hillary Rodham Clinton (D-NY) and Wayne Allard (R-CO) today joined with autism advocacy groups to unveil a new legislative initiative to expand access to treatment, interventions and support services for people with autism. The Expanding the Promise for Individuals with Autism Act (EPIAA) will provide initiatives and establish demonstration grant programs to enable people with autism and their families to live richer, fuller lives. Senators Clinton and Allard were joined by Bob Wright, Co-Founder, Autism Speaks; Lee Grossman, President and CEO of the Autism Society of America; George Jesien, Executive Director, Association of University Centers for Disabilities and Alison Singer of Scarsdale, New York, parent and sibling of individuals with autism. “It is a tragedy when children and adults with autism are not able to fully participate in their communities because they cannot access the services that would allow them to do so. The more we learn about autism, the more hope we have for treatment and the more tragic inaction becomes. This epidemic requires our smartest, best, comprehensive response and we must continue our efforts to provide treatment, care, greater research and understanding of autism spectrum disorder,” said Senator Clinton. “With more individuals being diagnosed with autism, and medical research demonstrating the importance of early intervention, I am pleased to support this bill, which will provide the critical funding and programs necessary to provide early diagnosis, treatment and services for autistic children, adults and their families,” said Senator Allard. “We thank Senator Clinton for her remarkable leadership in spearheading this legislation that has the potential to deliver real and meaningful change for millions of individuals and families impacted by autism,” said Bob Wright, co-founder of Autism Speaks. In the United States, one out of every 150 children has an autism spectrum disorder, and prevalence is on the rise. The range and severity of symptoms of autism vary from case to case, but symptoms often include difficulties in communicating, interacting with other individuals and sensory processing. The care involved in treating these symptoms often requires hours of intensive therapy every week – regimens that are often inaccessible to many families. Establishing a Demonstration Grant Program to Assist States with Service Provision. The Clinton-Allard bill will provide grants to states to help them provide evidence-based treatments, interventions and services. Developing a Demonstration Grant Program for Adult Autism Services. While early diagnosis and intervention services are critical for children with autism, the need for intervention and services continues across the lifespan. To help address the needs of adults living with autism, the Clinton-Allard bill will establish a demonstration grant program to help provide appropriate interventions and services to adults with autism. These grants will go to states to provide appropriate interventions and services, such as housing or vocational training, to adults with autism. Increasing Access to Services Following Diagnosis. Many children and families must wait months before gaining access to appropriate treatment after receiving a diagnosis of autism. To decrease this post-diagnosis waiting period, the Clinton-Allard bill will mandate that the Secretary of Health and Human Services develop guidelines to increase the amount and quality of post-diagnosis treatments, interventions, and services. The guidelines will also eliminate delays in access to supplementary healthcare, behavioral support services, and individual and family-support services through Federal and State funded programs. Increasing Support for Developmental Disabilities Centers of Excellence. Many families report difficulties in accessing services because of the limited number of health and education professionals who are trained to provide autism-specific services. To increase the number of individuals across sectors that can provide adequate care and treatment services for individuals living with autism, the Clinton-Allard bill will increase the capacity of University Centers for Excellence in Developmental Disabilities Education, Research and Service to train professionals in meeting the treatment, interventions and service needs of both children and adults living with autism. Examining Issues of Financing for Autism Services. The Clinton-Allard bill will require the Government Accountability Office (GAO) to study the financing of autism treatment and services, including current public and private insurance coverage for autism treatment and support services, and identify geographic and regional disparities in access to care. The GAO will make recommendations as to how to finance treatment and care services to remove both cost and geographic barriers and attain a uniform baseline of coverage across the United States. Improving Protection and Advocacy Services. Last year, thousands of individuals with autism were unable to access already-existing protection and advocacy services due to a lack of resources. The Clinton-Allard bill will create a program to expand these services to assist individuals with autism and other emerging populations of individuals with disabilities to meet the growing need for advocacy services among individuals with autism. Improving Technical Assistance and Evaluation. The Clinton-Allard bill will enable the Secretary of Health and Human Services to establish a National Technical Assistance Center for Autism Treatments, Interventions and Services to serve as a resource for parents and service providers. The organization will have experience in training, research translation, and service provisions. It will also analyze the grant programs under this Act and provide information about these programs to the public.